B-cell CLL/lymphoma 6 (BCL6) is a zinc finger transcription factor that acts as a sequence-specific repressor of transcription. It has been shown to regulate the transcription of STAT-dependent IL-4 responses of B cells. It contains an N-terminal POZ domain that interacts with other proteins to function as transcription co-repressors. The gene encoding BCL6 protein has been found to be translocated and mutated in diffuse large-cell lymphoma (DLCL) and may play a role in the pathogenesis of DLCL. 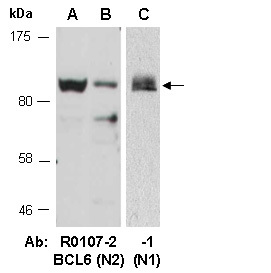 Rabbit polyclonal antibodies were produced by immunizing animals with GST-fusion proteins containing 2 distinct N-terminal regions of human BCL6. Antibodies were purified by affinity purification using immunogen. human BCL6 at RT for 2 h.